The world’s biggest shell banks were formed near Uddevalla around 10,000-11,000 years ago. At the time the edge of the inland ice sheet was sitting across lake Vänern. The ground was heavily weighed down beneath a sheet of ice several miles thick; once the ice had melted away the ground began raising fast at a rate of at least 7cm/year. At its highest the sea level was 145 metres above its present-day level, equivalent to almost at the top of the Uddevalla bridge pylons. The meltwater from the ice sheet rushed westwards into a cold and briny Arctic Ocean. This resulted in strong saltwater currents being forced eastwards inland beneath the rushing meltwater. The currents strengthened as they passed through the narrow straits where Uddevalla lies today. This turbulent marine environment provided the ultimate milieu for both sessile and free-swimming aquatic animals. Phytoplankton and zooplankton provided nutrition for filter feeders such as mussels, barnacles, ascidians, sponges, bryozoans etc. These in turn were eaten by snails, crustaceans and fish. A total of 23 shell banks were formed in the Uddevalla area with a total volume of 1 million cubic metres. The largest shell banks were formed at Porsen-Älje (20m), Bräcke-Kuröd (13m), Samneröd, and Kapelle. The white shell deposit hills surrounding the shell bank museum and the pond at Bräcke consist largely of Hiatella arctica and giant acorn barnacles. They also contain considerable amounts of sea mussels and sea snails. Overall, a total of 103 aquatic invertebrate species have been found in the Bräcke-Kuröd shell banks. Most of these are so-called glacial species; they lived here when this was an arctic ocean and were formed over a period of 200-1,000 years. Scientists who have explored this fauna include Carl von Linnaeus in 1746, J Gwen Jeffreys in 1862, Hjalmar Odhner in 1927, and Anders Warén in 1969. In addition, excavating the shell banks for the purpose of manufacturing chicken feed revealed several species of aquatic mammals, predominantly bones from ringed seals – the smallest of our native seal species – and also from killer whales, belugas, humpbacks, bearded seals, and polar bears. The oldest avian bones ever found in Sweden were discovered in the Samneröd shell banks in 1969. These were bones from eider ducks believed to be around 10,700 years old. When the town of Uddevalla celebrated its 500th anniversary, the council took the opportunity to create the Shell Bank Museum. The museum was opened on 26 August 1998 by the King and Queen of Sweden. On display at the Shell Bank Museum are collections of shells from Bohusläns Museum, donated by Robert Thorburn in the late 19th century. You can also view models and animations showing the melting of the ice sheet and the isostatic uplift of the land. A series of watercolours by Cia Callermo illustrate the species-rich and lime-loving flora. The biodiversity of insects is represented in the form of a selection of mounted butterflies and moths. Here you will be able to sample the rich and varied cultural and industrial history of the shell banks. The shell banks became a topic of heated debate between those wanting to preserve their unique structures and those wishing to exploit them. A recorded radio interview with factory owner Ragnar Steene, first broadcast in 1937, is available for listening. During a period of time in the 1950s and 60s, the motocross Swedish Championship and World Cup were held at the Kuröd banks. The Kuröd, Bräcke and Samneröd shell banks have been nature reserves separately for over 50 years. In 2010 a large nature reserve was created that covers all three, under the name of Kuröd nature reserve. In 1997 a programme of extensive felling, clearing and fencing was commenced to enhance the mosaic nature of the landscape with its rich biodiversity. Since 2004 this has been home to a herd of 10 or so cows and their calves. Their grazing and treading the land with their cloven hoofs have given the flora a fantastic boost. Successful nature conservation requires commitment, enthusiasm, cash, manpower, patience, and grazing animals (cattle). 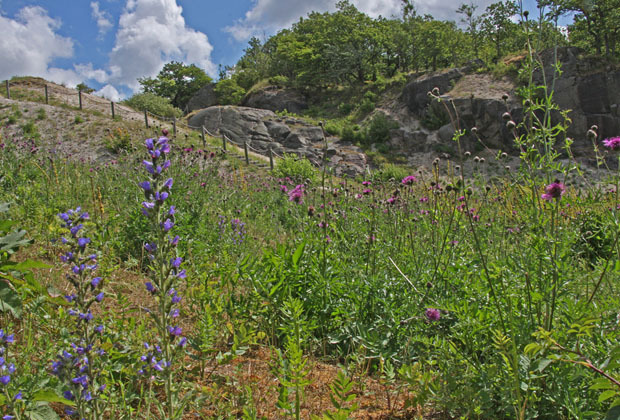 Together, Bohusläns Museum, Uddevalla Town Council and Västra Götaland County Council have achieved amazing results at the Kuröd shell banks nature reserve. Today these efforts can be enjoyed by our visitors all year round. Having said that, the shell banks are probably at their most beautiful at the end of May and beginning of June. The shell bank trail is a walking trail in the Kuröd nature reserve. It starts at the museum and runs in parallel with the Bohus Route; it is marked with the shell bank museum logo (a red plaque). The trail will take you past a series of information boards that outline how the banks were formed over time and describe von Linnaeus’ visit to the site, as well as settlements that date back to the early Stone Age, around 11,000 years ago, amongst other topics. There are also a number of derelict sites, some of which have intact stone foundations with ornamental trees, plants, cairns and stone walls. The trail also passes through large thickets of hazel, past a waterfall and down into the ‘Kuröd cauldron’ where you’ll be able to view the beehives. The trail then runs up the Kuröd hills, from where the views over Byfjorden and Uddevalla bridge are magnificent. It then descends the hill on the other side, passing a hayfield which is hand-mown using scythes in July and August each year and adorned with old-fashioned hayracks. The slopes of the Kuröd hills are home to the most species-rich flora of plants and grasses. Every day 11-17 except for Midsummer Eve and Midsummer Day when the museum is closed. You can always visit the shell banks, and go the shell bank trail even if the museum is closed.